There are many full time private investors out there but for others investing is a hobby or something that they fit around their day to day activities. If you don’t have a lot of time on your hands one of the toughest tasks you will have is narrowing down the list of potential investments on which to focus your research efforts. The good news is that you can save yourself a lot of time and wasted effort by setting up a checklist. In this article, I am going to show you some very straightforward questions or checks which can give you a guide as to whether a company is worth more of your time or not. This will be from the viewpoint of a long term investor rather than that of a short term trader of shares. Don’t worry if you are not familiar with some of these terms – now is the time to learn as understanding them will stand you in good stead in the future. You can do virtually all of these checks in a matter of minutes in SharePad. What will you own a slice of? This check will take up most of your time but it is the most important one. Peter Lynch, a successful American fund manager and author of the book ‘One up on Wall Street’, has given lots of good advice to investors over the years. Probably some of his wisest words were “know what you own and why you own it’. If you can’t understand what a company does and how it makes money and you can’t explain this to a friend then it’s probably not a good idea to invest in its shares. Understanding a company is so important if you are a long term investor. This is because good investing essentially boils down to owning stakes in good businesses for as long as possible. By concentrating on the performance of a business you understand rather than its share price I’m convinced you will make better investment decisions. Has the company been growing and can it keep on doing so? The main reason to own a share in a business is to benefit from the growth in its future profits. Generally speaking, as profits grow a business will become more valuable. What has happened in the past may not happen in the future but a company that has been growing can be a good sign that it has some attractive products or services which people like. Pay particular attention to growth in revenues or sales. Profits growth that comes from selling more is much more reassuring than growth that has come from cutting costs. This is because sooner or later a company runs out of costs to cut. 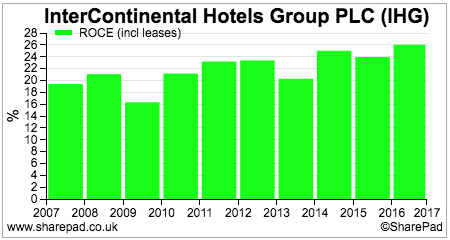 If we look at the turnover and profits history (EBIT) of equipment hire company Ashtead we can see that growth has been pretty good. 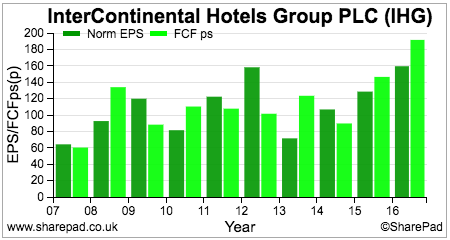 The lighter bars on the right of the chart relate to forecasts from City analysts. These should always be treated with some caution as human beings don’t tend to have a great track record in predicting the future. That said, expectations of growth continuing is a good sign. Looking at a company’s turnover and profit history can be very helpful. You should try and look back at least ten years if you can as this will give you an idea how a business performs in different economic climates. 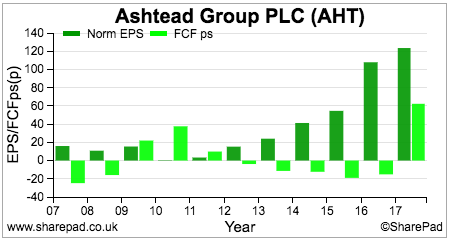 Note the dip in 2009-10 with Ashtead. If you see something like this, look at its annual report and find out why this happened. Was it to do with a business specific issue or economic or industry weakness? Ask yourself if this could happen again? If yes, then ask yourself if you can cope with owning a business with these characteristics. If you decide to dig a little more, check to see if a company has been growing by buying other companies (acquisitions). This is not necessarily a bad thing but companies can try to cover up a shrinking business by buying companies whose profits give the impression of underlying growth. The fact that a company is profitable is always a good sign. But you need to know how profitable it is. Profit margin – this shows how much of a company’s turnover is turned into trading profits. Divide trading profit (EBIT) by turnover and express as a percentage. Return on capital employed (ROCE) – This measures trading profit as a percentage of the money that has been invested in the business (its capital employed). The higher both these numbers are, the more profitable a company is. Consistently high profit margins and ROCE are usually signs of a very high quality and resilient business. Intercontinental Hotels (IHG) is a great example of this. High margin businesses often make better and safer investments than low margin ones. High margins can be a sign of a business with a very strong competitive position. They also offer more protection against a downturn in profitability. Very low margin businesses – less than 5% – can see their profits disappear if they get into a sticky patch. Carillion (LSE:CLLN) is a good recent example of this. Generally speaking, consistent profit margins of 10% or more can be a sign that you are looking at a half decent business. Are the profits backed by cash? One feature of a truly outstanding business is that it turns all or most of its profits into something called free cash flow. This is the cash that essentially can be paid to shareholders after all the company’s costs and investments have been paid for. One of the best ways to see if a company is good at this is to compare its profits or earnings per share (EPS) with its free cash flow per share (FCFps). Ideally you want to see FCFps close to or more than EPS in most years. Again IHG scores reasonably well on this test. Companies with high levels of free cash flow compared with profits are desirable for two main reasons. Firstly, it is usually a good indication that a company’s profits are genuine and believable. Investors in many companies in recent years would have saved themselves a lot of stress and money if they had just performed this simple check. Free cash flow that is significantly less than profits can be a sign that something dodgy is going on. Secondly, it means that a company can produce lots of cash for its shareholders. This can be paid to them in dividends or reinvested in the business to produce more free cash flow in the future. A couple of words of caution here. Sometimes a company can cut back on investing to boost its free cash flow. This might hurt the long term competitiveness of the business which means that good free cash flow might be a sign of weakness rather than strength. The ability to turn profits into free cash flow is a very desirable characteristic of a business, That doesn’t necessarily mean that companies with poor or negative free cash flows are bad and should be avoided. Let’s look at Ashtead again. Its free cash flow chart is not a pretty sight. It’s perfectly reasonable to ask whether Ashtead is a dodgy business or just a very poor one on the back of these numbers. But dig a little deeper and you can find out that this is not as bad as it looks. This is because Ashtead has been investing heavily in new assets – new equipment – to grow its business. This has been a drain on its free cash flow. What you should do is look at the return the company has been getting on the money it has been spending. 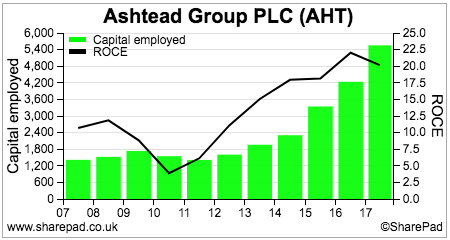 In ten years the amount of money invested in Ashtead (capital employed) has grown from £1.2bn to £5.4bn. 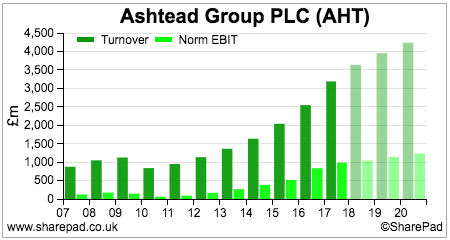 Yet that bigger sum of money has been earning more profit as shown by a big increase in ROCE. Think of this as being similar to ploughing more of your wages into a savings account paying higher rates of interest. What’s not to like about that? 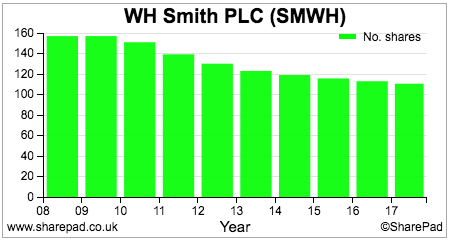 Here Ashtead’s poor free cash flow is not a bad sign at all. It appears to have spent its shareholders’ money very well indeed. This explains why its profits have grown so strongly. Does the company have lots of debt or hidden debts? There is nothing wrong with a company borrowing money to finance its business. As long as that money earns a decent return (ROCE). Problems arise when a company has too much debt relative to its profits and cash flows. As a shareholder you should never forget that you are last in the queue to get your hands on a slice of the company’s profits. The more debt a company has, the more interest it has to pay to its lenders. If trading profits take a tumble it can mean that your slice of the cake can fall significantly. Companies also have other liabilities which are essentially the same as debt such as pension fund deficits and obligations to pay rents for buildings and equipment. These should not be ignored. 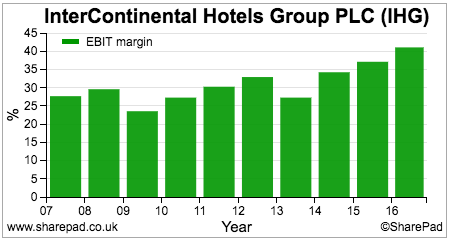 Interest cover (min 5 times) – This measures how many times trading profits can pay the annual interest bill on borrowing. Fixed charge cover (min 2 times) – This measures how many times trading profits can pay the annual rent and interest bills. Net debt to EBITDA (max 3 times) – a crude measure of how long it would take a company to pay off its borrowings, rent obligations and pension fund deficit from its pre-tax gross cash flow. Finding completely debt free companies – no borrowings, rents or pension fund deficits – is an even safer way to invest. 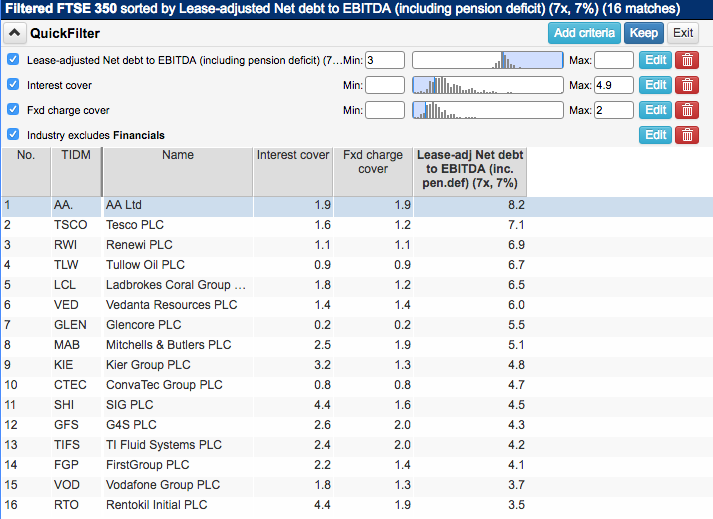 Here is a quick filter from SharePad which shows companies in the FTSE 350 index that FAIL these three debt rules I have set. Financial companies have been excluded as they are naturally financed with lots of debt. Is management invested in the business? I want to invest in companies where the directors (principally the chief executive and the finance director) own plenty of shares. It’s called having skin in the game and it’s good to see management have plenty as it means their interests are aligned with yours. Ideally you should look for a value of shareholding that is at least twice the annual salary if the chief executive, the finance director or operations management. You will need to look at the latest annual report to check on salary levels. Family dominated businesses such as James Halstead pass this test very easily. This is fine as long as the dominant shareholding is not damaging the long term health of the business. 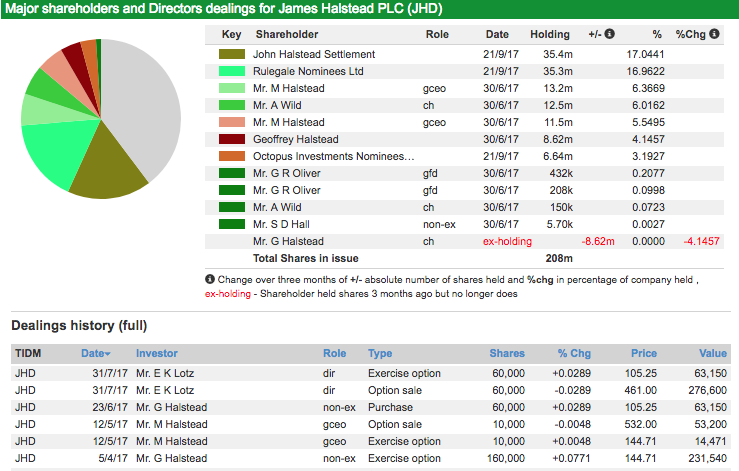 You can quickly check the shareholdings of directors and whether they have recently been buying or selling shares in SharePad. 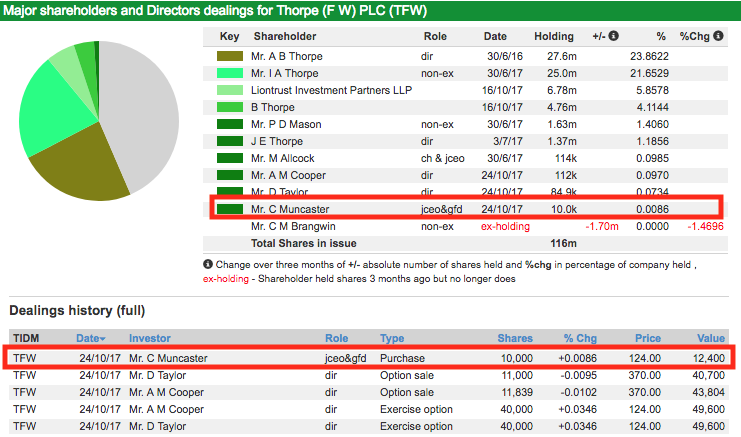 One of the reasons I have not bought shares in lighting company FW Thorpe – which is a good business in my opinion – is because the finance director and joint chief executive owns so few shares. Despite having been at the company for a good few years now he has only recently bought 10,000 shares which are currently worth around £32,000. Are the shares good value or not? 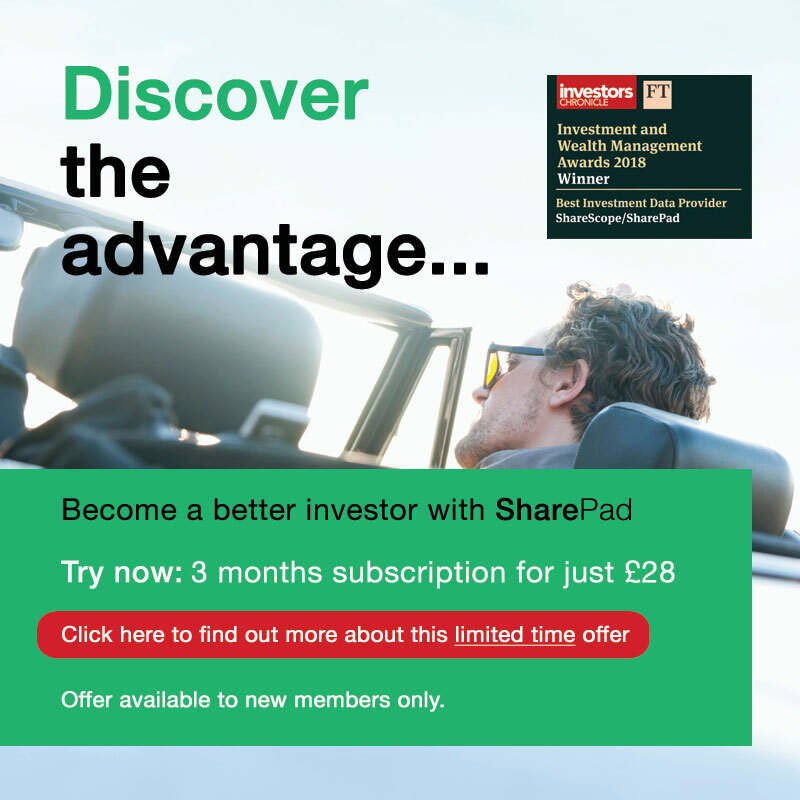 Valuing shares is a huge topic for investors and I’m not going to get into that here as I’ve written lots about it before. As with debts, I think it’s a good idea to find a valuation measure you understand or are comfortable with and set some rules. A forecast rolling PE of no more than twenty times. A rolling PE is better than using the next forecast PE as the rolling measure is based on a full year of forecast profits. A price earnings growth (PEG) ratio of no more than 1.5 times. This is where the PE number is not more than 1.5 times the earnings growth number. What’s happening to the share count? Be wary of companies that keep issuing new shares on a regular basis. This might mean that your stake in a business is reduced over time. Companies with a shrinking number of shares can be attractive investments as you end up owning more of the business. WH Smith (LSE:SMWH) has been a good example of this. Applying these simple rules may mean you may miss out on some outstanding companies that buck the rules but it will reduce the chances of investing in stocks which end up disappointing you. Many of the these checks can be done in minutes using the Financial Charts carousel on SharePad’s Financial Summary view. 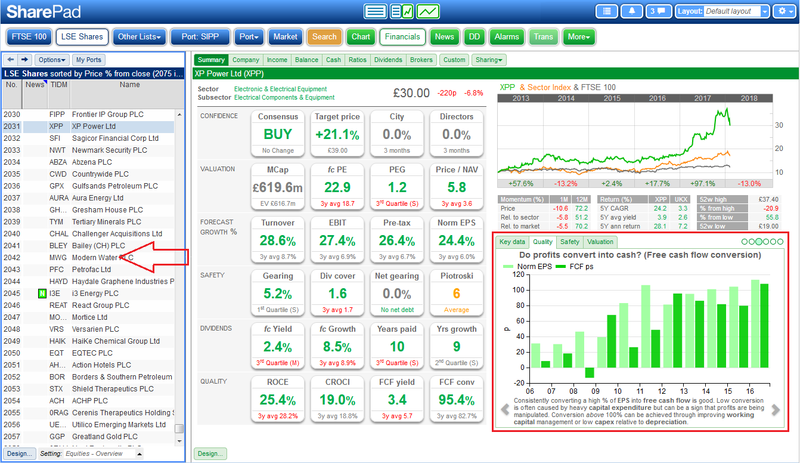 If you use SharePad in split screen view, you may need to scroll down the Financial Summary view to see the financial charts. Alternatively, make the Financial Summary view full screen, or drag the split-screen divider to the left to create more space.